Central Catholic football players Jimmy Mootz (left), Kyle Jacklich (center) and Adrian Cuevas signed letters of intent to continue their education and playing careers at four-year universities on Wednesday, Feb. 6, 2019. All three were honored during a lunchtime ceremony in the foyer of the Mark Gallo Health and Fitness Center. The top-ranked football team in the region once again took top billing, this time celebrating a huge victory on National Signing Day. 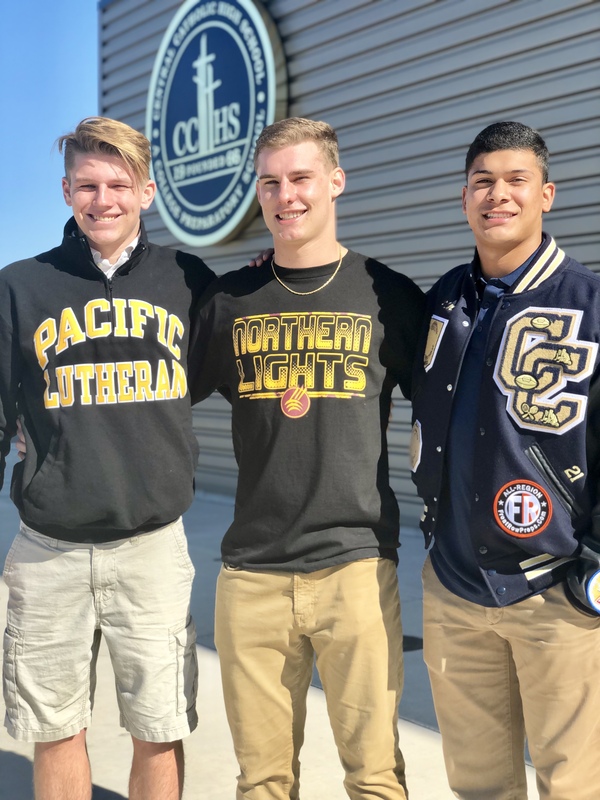 Central Catholic had three seniors commit to four-year universities during a ceremony inside the Mark Gallo Health and Fitness Center on Wednesday afternoon, including running back Kyle Jacklich, defensive back Adrian Cuevas, and wide receiver Jimmy Mootz, who will also swim at Pacific Lutheran University in Washington. A fourth, highly-touted running back Dawaiian McNeely, opted to formally announce his college decision on Wednesday evening with his personal trainer, Les Bonsu of Bonsu Elite Athletics, and a group of BEA athletes. Around 1 p.m., McNeely confirmed his commitment to the University of Wyoming in a tweet. "We're all signing together," Jacklich said before the noontime event. "It's a 'We' thing at this school. No one likes to sign by themselves, because we didn't get here by ourselves. We worked as a team to get here, so it was important we sign our letters together." 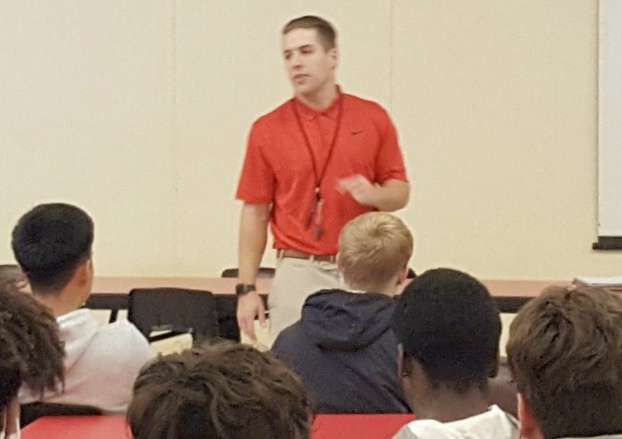 Central Catholic athletic director Billy Hylla used words such as "inspiration" and "resiliency" to describe Jacklich, Cuevas and Mootz before a packed audience in the foyer of the multi-million dollar gym. 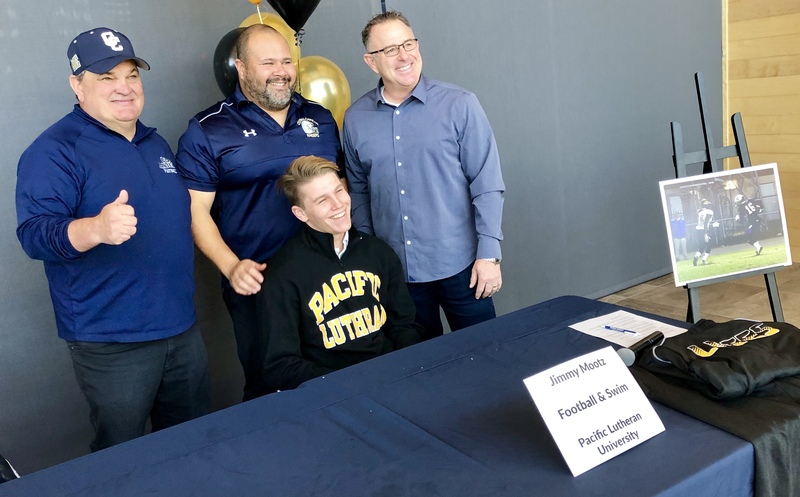 Central Catholic wide receiver Jimmy Mootz will continue his football and swimming careers at Pacific Lutheran University. Here, Mootz is joined by members of the Central Catholic football staff, including head coach Roger Canepa (left). Even in his absence, McNeely drew praise from Canepa. 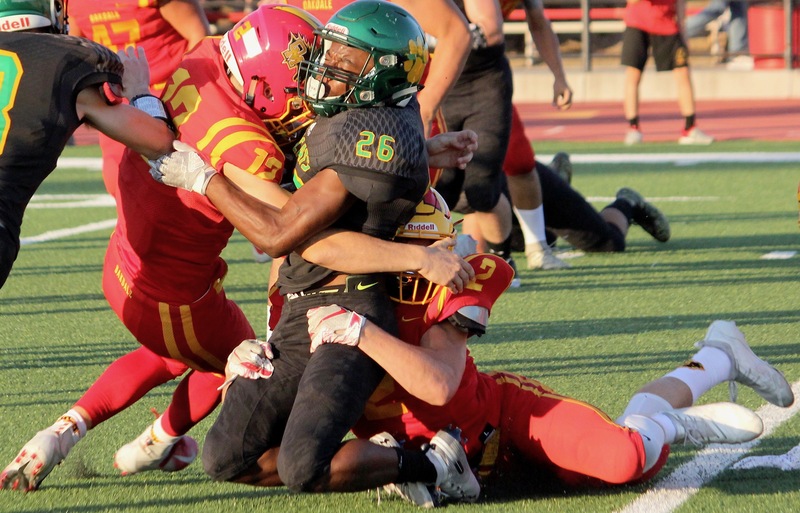 McNeely held nine Division-I offers, the most for any senior in the region, and the suitors came from far and wide: Arizona State, Colorado State, Fresno State, Hawaii, Nevada, Oregon State, Tulane, Utah State and Wyoming. "Wyo is home," McNeely tweeted. 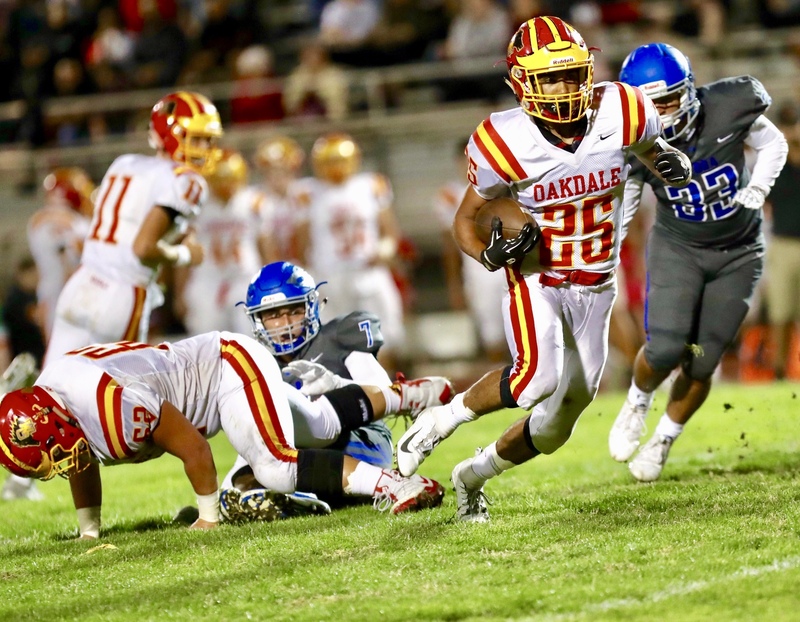 The 6-foot-2, 200-pound running back/defensive back enjoyed a banner season for the Sac-Joaquin Section Division II finalists. McNeely rushed for a team-high 1,073 yards, finishing 10 of those runs in the end zone. He shared the Valley Oak League’s Offensive Player of the Year award with Manteca junior Jacob DeJesus and was a FrontRowPreps.com All-Region pick. McNeely also had 35 tackles and nine pass breakups. A hard-hitting safety, Cuevas earned All-VOL and FrontRowPreps.com All-Region honors after racking up a team-high 67 tackles and six pass breakups, despite playing several games with a broken hand. He was courted by many, including Sacramento State (preferred walk-on) but will attend Marian University in Indiana and study business. 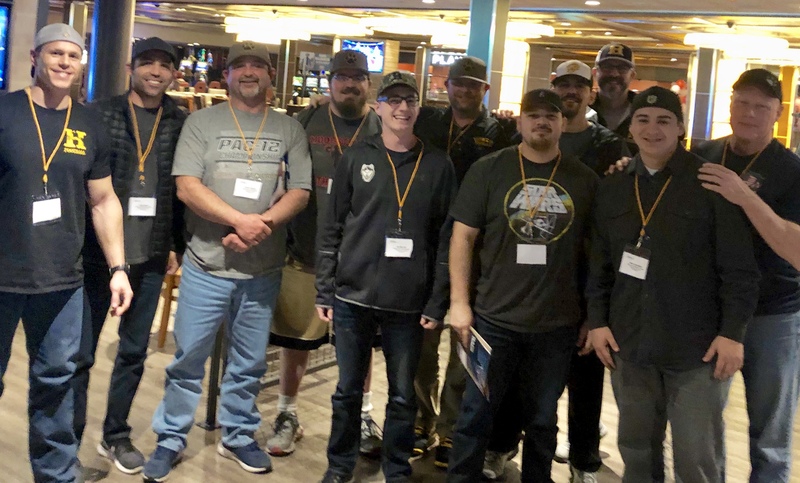 Jacklich was a major get for Montana State Northern coach Andrew Rolin, who made the Central Valley a point of focus on the recruiting trail. 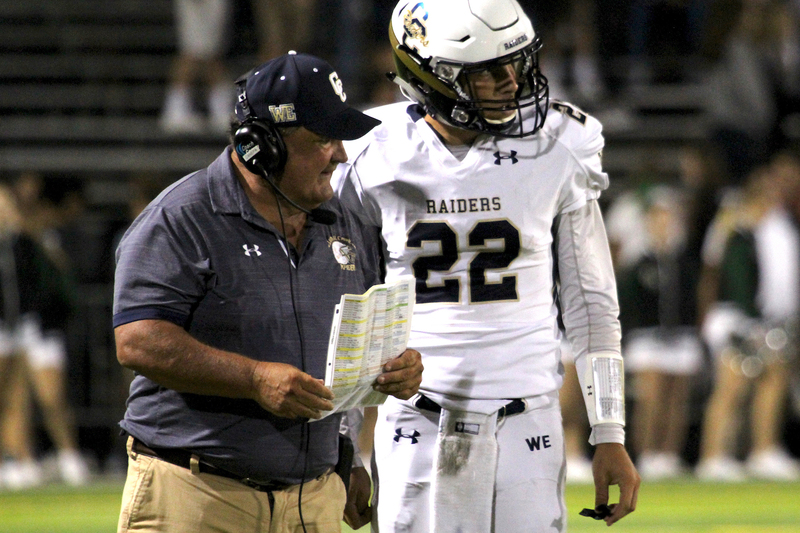 Rolin also offered Jacklich’s Raider teammates Chris Mendoza and Mikey Duran, a pair of decorated offensive linemen weighing multiple offers. Neither participated in Wednesday’s signing celebration at the school, but Canepa hinted their turn in the spotlight is near. Jacklich rushed for a team-high 17 touchdowns and is the embodiment of commitment and focus, said Hylla. He began the season as the third option in the backfield, behind McNeely and D'Angelo Bellamy, and finished as the team’s second-leading rusher (993 yards). He will play running back at Montana State Northern. “To be able to sign a letter of intent and play football at a four-year college is huge," Jacklich said. "That's everything I've dreamed of and worked for as a little kid. To have this day is awesome." Jacklich has already had an impact on the Northern Lights, helping Rolin land Gregori star Marcello Longstreth, a former Pop Warner teammate. Jacklich pointed Rolin toward Gregori, where Longstreth has been an all-league player the past two seasons. He was the Modesto Metro Conference’s Special Teams Player of the Year and first-team wide receiver in 2017, and an All-Central California Athletic League selection on both sides of the ball this fall. Longstreth signed his letter of intent Wednesday morning, hours ahead of his celebration in the school library. Mootz had two receptions and five tackles in his final season.